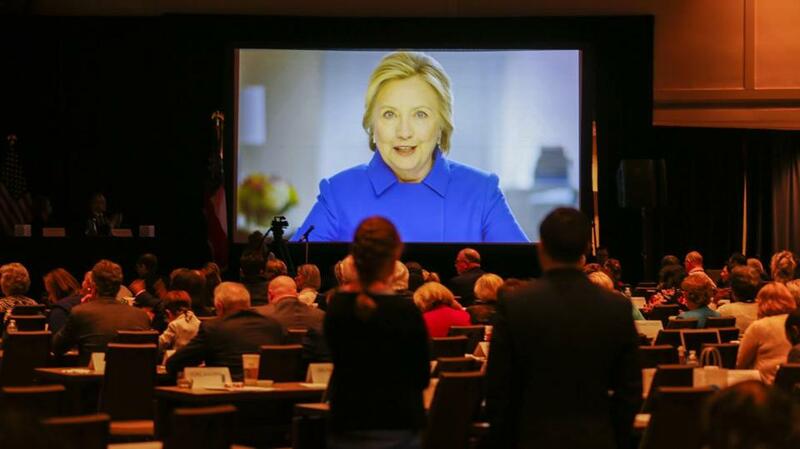 Hillary Clinton delivered a videotaped address during the Democratic National Committee Winter Meeting in Atlanta, GA in February. WASHINGTON — Hillary Clinton’s campaign and the Democratic National Committee helped fund research that resulted in a now-famous dossier containing allegations about Donald Trump’s connections to Russia and possible coordination between his campaign and the Kremlin, people familiar with the matter said. Marc Elias, a lawyer representing the Clinton campaign and the DNC, retained Fusion GPS, a Washington, firm, to conduct the research. Fusion GPS hired dossier author Christopher Steele, a former British intelligence officer with ties to the FBI and the US intelligence community. Elias and his law firm, Perkins Coie, retained the firm in April 2016 on behalf of the Clinton campaign and the DNC. Prior to that agreement, Fusion GPS’ research into Trump was funded by a still unknown Republican client during the GOP primary. The Clinton campaign and the DNC through the law firm continued to fund Fusion GPS’ research through the end of October 2016, days before Election Day. Fusion GPS gave Steele’s reports and other research documents to Elias, the people familiar with the matter said. It is unclear how or how much of that information was shared with the campaign and DNC, and who in those organizations was aware of the roles of Fusion GPS and Steele. One person close to the matter said the campaign and the DNC weren’t informed of Fusion GPS’ role by the law firm. People involved in the matter said they would not disclose the dollar-amounts paid to Fusion GPS, but said the campaign and the DNC shared the cost. US intelligence agencies later released a public assessment which asserted that Russia intervened in the 2016 election to aid Trump. The FBI has been investigating whether any Trump associates helped the Russians in that effort. Fusion GPS’ work researching Trump began during the Republican presidential primaries when the GOP donor paid for the firm to investigate the real estate tycoon’s background. These people said it is standard practice for political campaigns to use law firms to hire outside researchers in order to ensure their work is protected by attorney-client and work product privileges. The Clinton campaign paid Perkins Coie $5.6 million in legal fees from June 2015 to December 2016, according to campaign finance records, and the DNC paid the firm $3.6 million in ‘‘legal and compliance consulting’’ since Nov. 2015 — though it’s impossible to tell from the filings how much of that work was for other legal matters and how much of it related to Fusion GPS. Officials have said the FBI has confirmed some of the information in the dossier. Other details, including the most sensational accusations, have yet to be verified and may never be.